University Baptist Church was founded in 1917 by a group of prominent Baltimore businessmen who wanted to establish a Baptist witness to Johns Hopkins University and the Northern Baltimore community. Of the charter members, forty came from Eutaw Place Church. Among the founding members, there are several who are of particular interest to Baptist history. Eugene and Joshua Levering were cousins of Annie Armstrong who founded the Woman’s Missionary Union. The more famous of the twins, Joshua Levering, was a strong supporter of the temperance movement and became the presidential candidate of the Prohibition Party in the election of 1896. He also founded what was to become the Southern Baptist Convention’s Brotherhood Commission. Willoughby McCormick, founder of McCormick and Company, also started the Baptist Children’s Aid Society, which is now known as Building Families for Children. Amzi Clarence Dixon served as UBC’s first pastor. He pastored several churches previous to UBC and was a popular speaker at Bible and Prophesy Conferences held in both the United States and in England. University Baptist Church was designed by John Russell Pope, a remarkable architect who also designed the Baltimore Museum of Art, the National Gallery of Art, and the Jefferson Memorial. On October 30, 1921, the opening service was held in the main building, although the sanctuary wasn’t completed until 1927. The Hamilton C. Davis Memorial Chapel was dedicated in 1960. As many of the same materials as possible were used, with the result that the original Indiana limestone of the old building now blends with the new. Green Ludowici tile was also used in the new building to conform with that in the original structure. The five stained glass windows were fabricated by Connick Studios of Boston, one of the finest artisans in ecclesiastical stained glass. The church design was conceived as part of a number of plans for buildings for Johns Hopkins University and the surrounding area. While JHU did not go forward with Pope’s designs, this building remains as a mark of his ideas for the aesthetic of Baltimore. 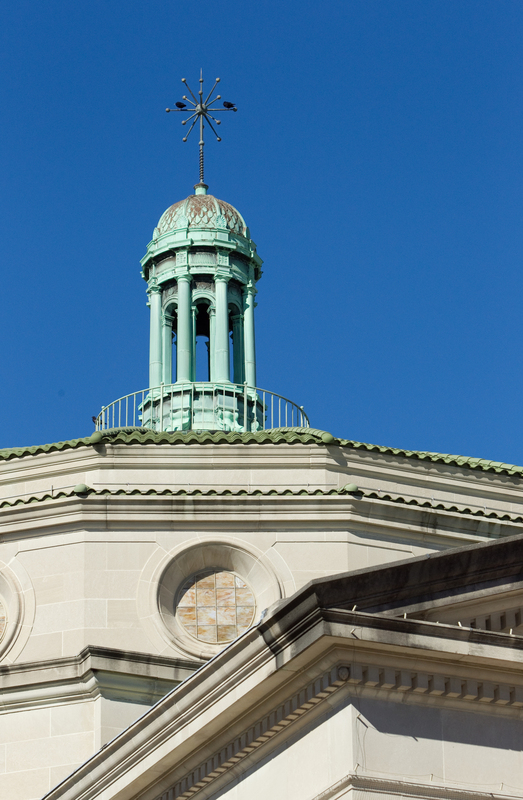 Among the many wonderful features of this historic building is the cupola that houses our sanctuary and stands out as a unique landmark in Charles Village.